A look at the world of politics, statecraft, diplomacy and books The Life of Pi by Yann Martel is a novel set in Pondicherry, at least a part of it. Recently I read the book and being a historian by inclination and profession decided to locate the sights and scenes of the novel in the actual real context. The surreal echoes of the novel in some ways reflects the very real spiritual ambiance of the city, I had an earlier opportunity to research the history and built heritage of Pondicherry when Professor J A K Tareen requested me to do the Pages from History. Since then I have been interested in the past of this city where I have lived and worked for more than a quarter of a century, a city I now consider my home as my child was born here. The past creeps upon you in Pondicherry" the names of the streets, the town planning with is grid like pattern of streets and residential areas, the division of the town into a black town--ville noir-- and a white town--ville blanche--the churches and temples and above all the spiritual radiance from the Ashram which houses the graves of both Sri Aurobindo and the Mother. Any visitor to this city leaves a part of his soul behind when he or she leaves.Life of Pi is also a story of struggle, longing and memory making it a great piece of contemporary literature. The novel is a first person narrative of a boy,Piscine Moiltor Patel, named after a swimming pool in France. 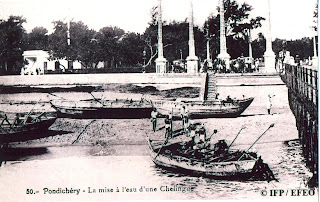 The French presence is still heavy in Pondicherry, The history of Pondicherry really began when the French East India Company in the late seventeenth century acquired a piece of land on which it buit Fort Barlong, perhaps the very site of the Government Park which stands opposite the Governor's Palace in the heart of the White Town. 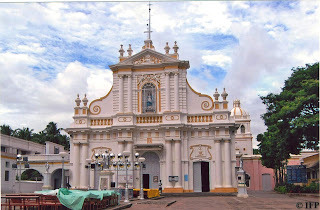 We know a good deal about the life and conditions in Pondicherry in the eighteenth centry due to the fortuitous survival of the Journal of a bi lingual trader and merchant of the town, Ananda Ranga Pillai. In the early centuries of the Christian era, when Rome was the most powerful empire in the world, the emporia of Podule is mentioned by the Roman geographer, Pliny. 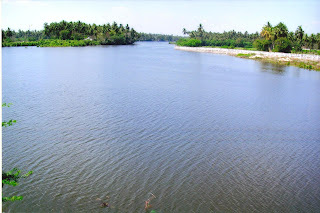 Perhps it sttod close to the placid waters of the Ariyankuppam River. 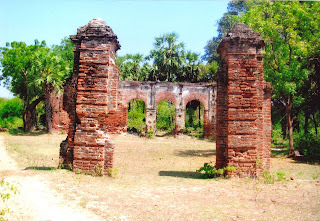 Close by the archaeological site of Arikamedu are the remains of the Jesuit House built in the eighteenth century. Local legend has it that the bricks used for the construction came from the archaeological site. The wars between the French East India Company and thhe English East India Company, a part of the global struggle for supremacy played itself out with great fury in Southern India and Pondicherry bore the brunt of the destruction during the wars. The American War of Independence and the Anglo-French struggle for supremacy called the Carnatic Wars by historians are both parts of the same historical moment. 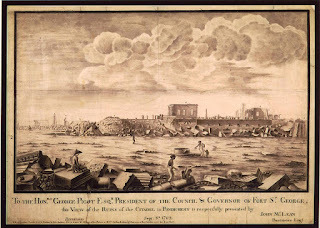 The English defeat in North America made the East India Company ever more intense in its determination to conquer India and defeat the French. 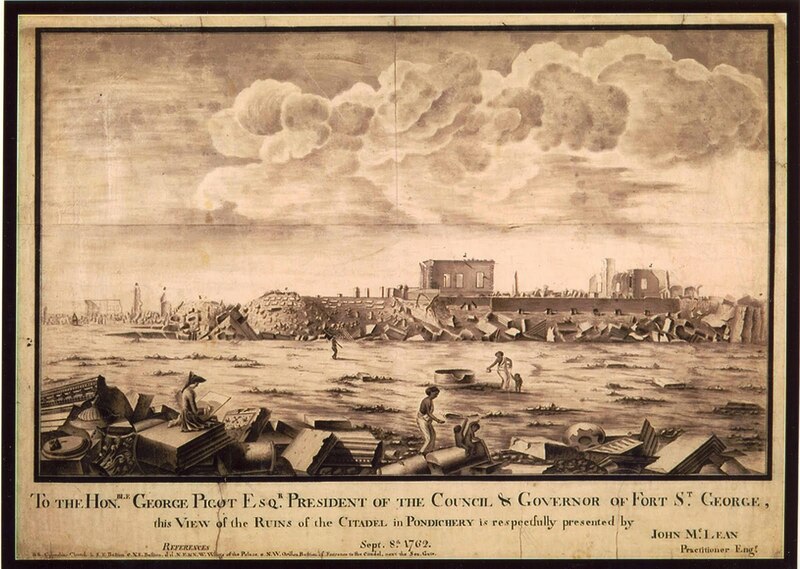 A contemporary wood cut illustrates the destruction of the city. 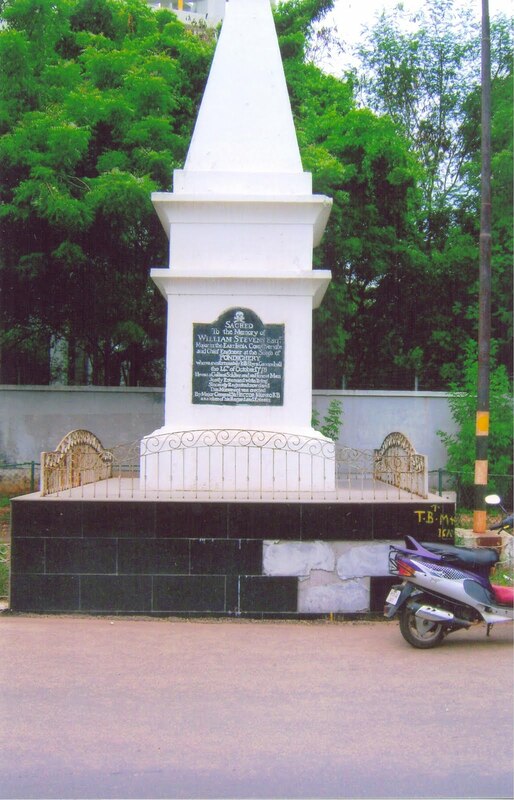 The war memorial erected by the soldier who won the Battle of Buxar, General Hector Munro in memory of a soldier who was killed in one of the battle for control over the fortified town of Pondicharry stands near the entrance to the town. A contemporary report refers to the fall of Pondicherry and calls the area Red Hills now corrupted as Gori Medu. Pi must have seen and wondered what this monument represented. Such memorials re common all over the battle grounds of the English and the French. 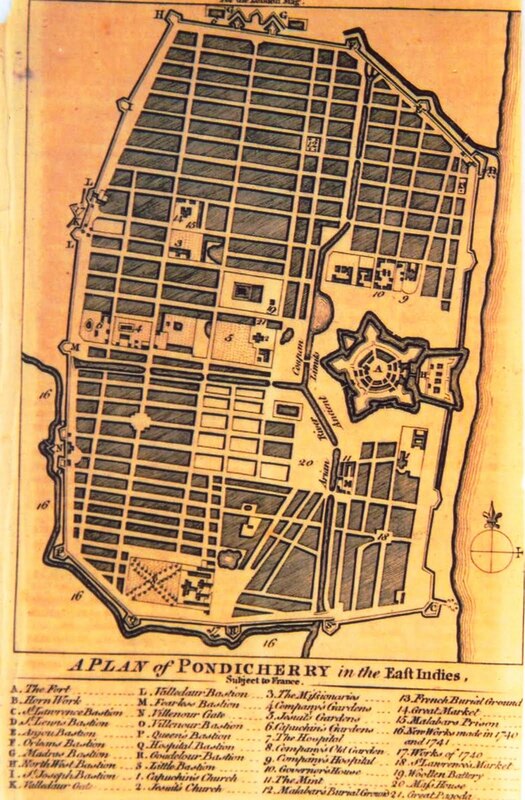 In the eighteenth century the town of Pondicherry acquired the shape that it has today. 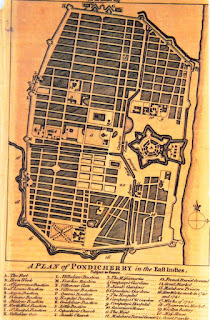 The map given below illustrates the town as is would have been at the time of the Napoleonic Wars in the late eighteenth century. 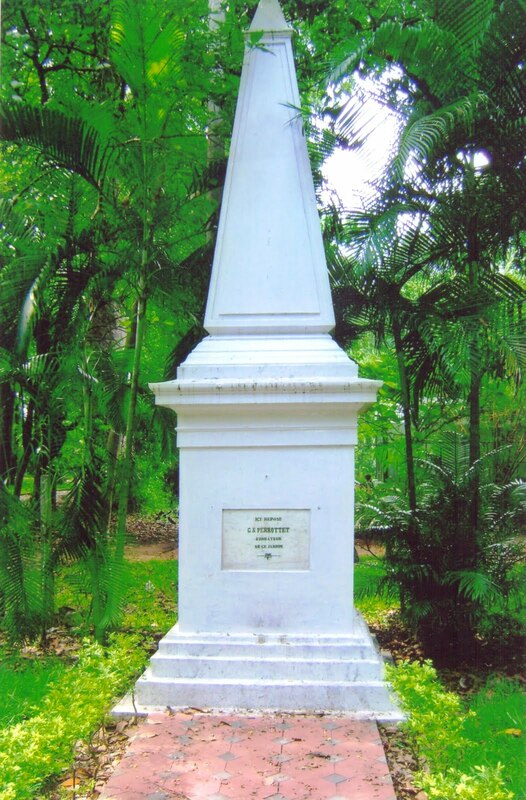 There was a real fear that the alliance between Tippu Sultan and the France would result in ann invasion of Pondicherry. 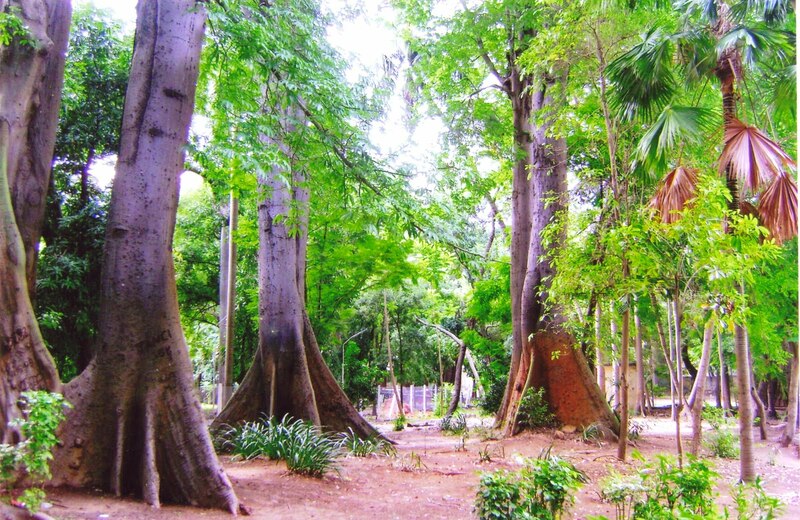 The grave of the founder of the Botanical Garden is located within the Jardin de Botanique. Surely Pi must have played hide and seek there. Perottet was responsible for bringing hundreds of seeds and planting them in this veritable Garden of Rden in which Richard Parker lived. 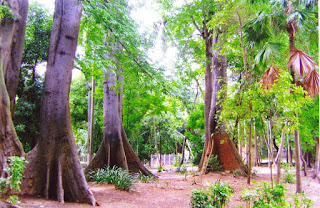 The tall tress in the Jardin de botanique have faces the vagaies of the monsoons for over 2 centuries. yers were offered in this mosque. The town in which Pi grew up was filled with beautiful relics from the French past. 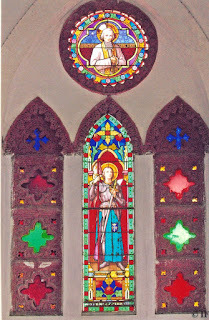 The Cathedral of the Immaculate Conception located on Mission Street still retains its Gallic extravagant beauty. 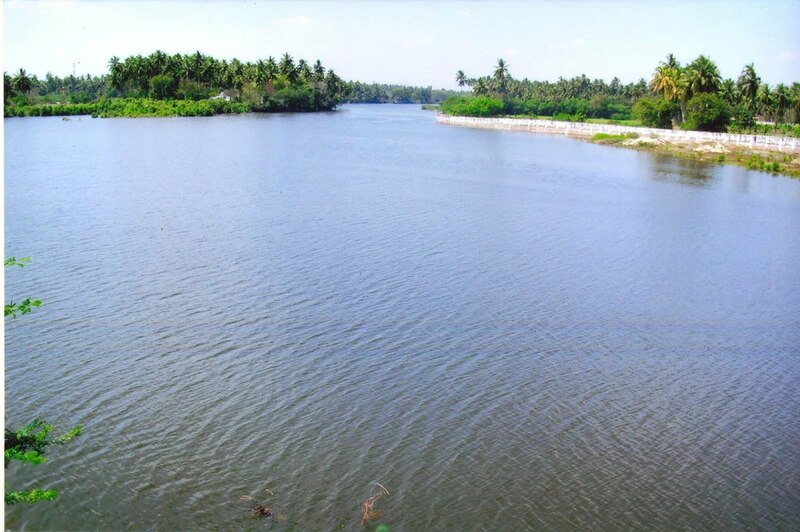 There is a native belief that the Temple dedicated to Lord Siva stood at this site. 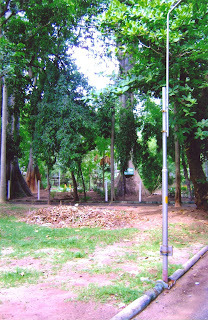 However there is no archaeological or historical evidence to link this monument to the temple whose destruction was ordered by Dupliex and recorded as such by Ananda Ranga Pillai. Beautiful stained glass windows are found in all the major churches of Pondicherry and this one illustrates Jean d'arc. Much of the architectural heritage of Pondicherry is due to the interest taken by Napoleon III during the Second Empire (1848-1871). 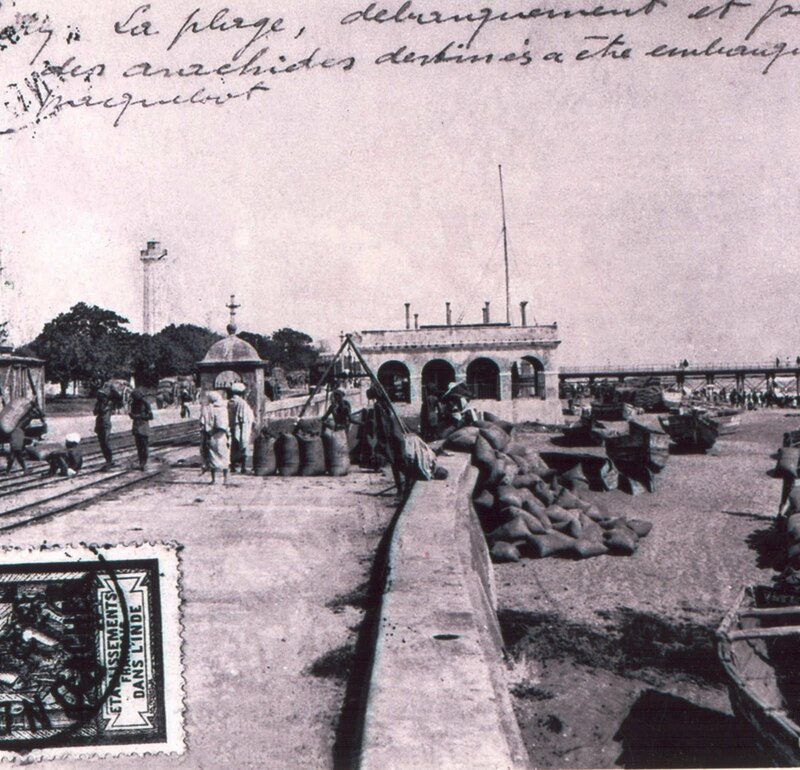 The nephew of the famous Bonaparte, Napoleon III was interested in transforming Pondicherry into a vibrant capital of the French Outre Mer. One striking example is in the Government Parade Ground later converted into a Park. 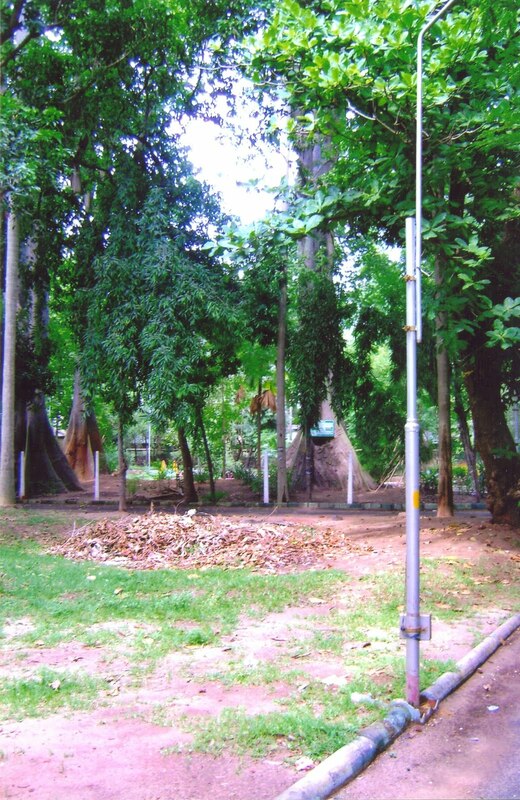 Now the place is called Bharati Park and perhaps Fort Louis stood on this exact site. While the palce was being beautified recently a number of interesting historical objects were uncovered including the remains of an underground staircase. This monument in typical neo classical style records the legend surrounding the excavation of the large artificial tank at Mutrapalayam. 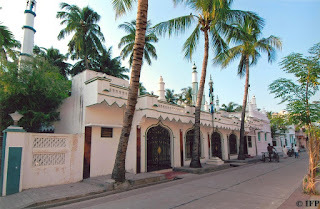 The view of the same structure in the late noineteenth century is given below. There are frequent references to ports, and harbours in the Life of Pi. In fact his father charters a ship, a cargo ship to ferry the animals of the zoo, including Orange Juice, Richard Parker and the Hyena along with his family to Canada and the cargo ship sets sail from Pondicherry. 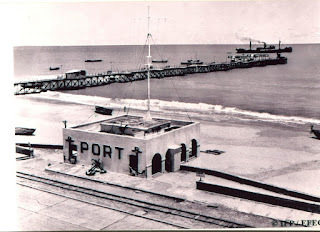 In the last century Pondicherry was a road stead and with the opening of the Suez Canal the port of Pondicherry started exporting ground nuts, oil seeds and cotton goods. 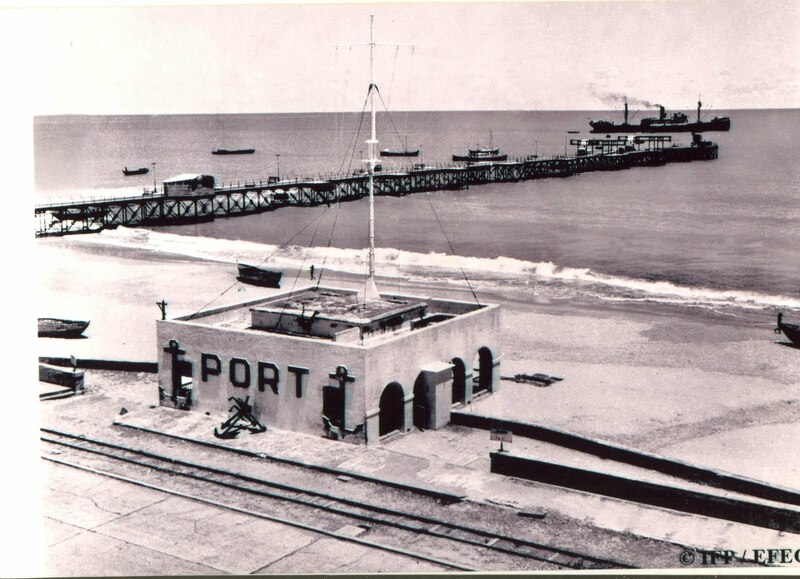 A contemporary photograph gives us a glimpse of the port of Pondicherry. The Port building itself has become the Le Cafe Cafeteria on the Promenade. 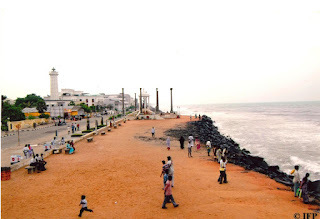 The stretch of the sea shore now known as the Promenade appears frequently in the Life of Pi. The Asram Swimming Pool whre Pi learnt to swim is located at the far end of this stretch of the road. The Light house visible was built in 1838. The story behid the construction of this Lighthouse is interesting and is recorded in the Annales Martimes. Apparently the large chiney of the Porto Novo Iron ans Steel Works located near Cuddalore was visible to the sailors and many of the ships mistook the flaring chimney to be a lighthouse and headed straight to the dangerous shoals and sand bars. To warn the sailors of the impending danger this light house was constructed and is now a major landmark of Pondicherry. The custom house is located close by. Accoding to the inscription in French the statue of Dupliex was reected by Governor BonTemps when Napoleon III was in power. 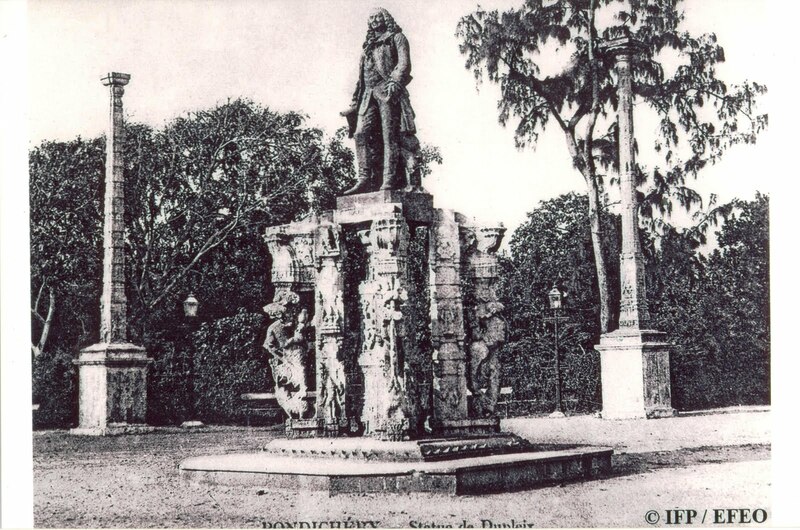 After sending him in chains from Pondicherry, this great patriot was recognised as a hero of the French Nation hundered years later during the waning days of the Second Empire. 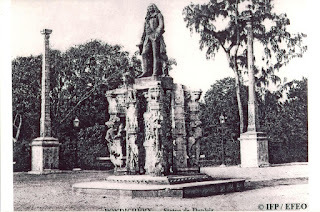 The statue stands on pillars--spolia-- from Hindu temples and after Independence this statue and the pedestal were removed. 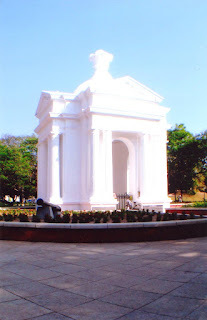 Pondicherry remains to this day a beautiful city. Though the culture of the place has deteriorated and lawlessness is rampant and the city or Union Territory suffers from the close nexus between politicians and criminals, tourists like to see the LAND OF PI. Richard Parker Pondicherry is your real home and we will bring you back from Mexico.